You can read a full report of the event here. Apologies to any group whose banner I’ve not got a photo of, and the speakers I’ve missed.. and of course anyone else who would have liked to have seen their face here. Thanks to everyone who turned out to make this such a great day, and to the sun for shining on us all. 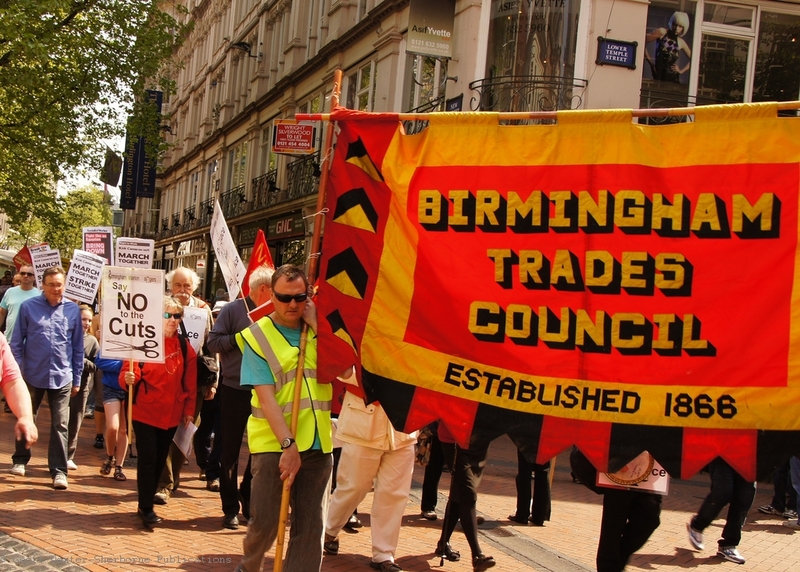 Hundreds of people took to the streets of Birmingham today to celebrate the trade union movement and demonstrate against the cuts. 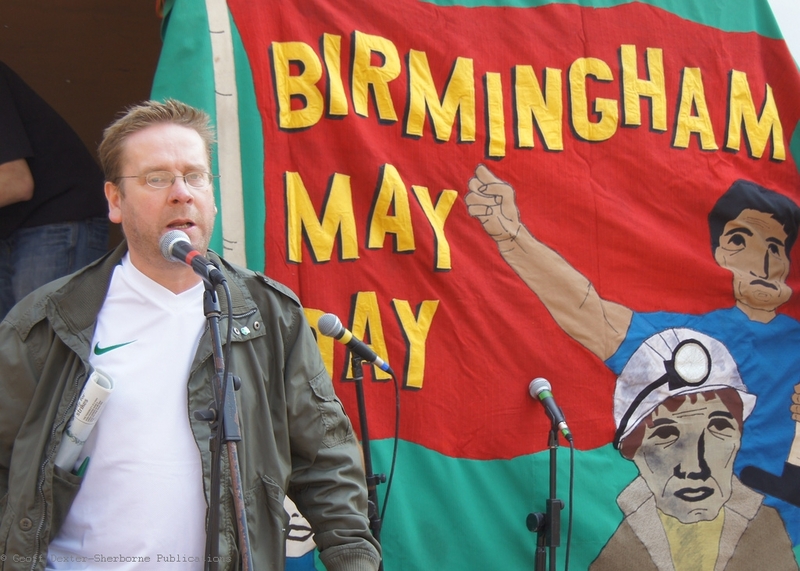 Mayday is the traditional workers holiday and every year Birmingham Trades Union Council (BTUC) organise a celebration. 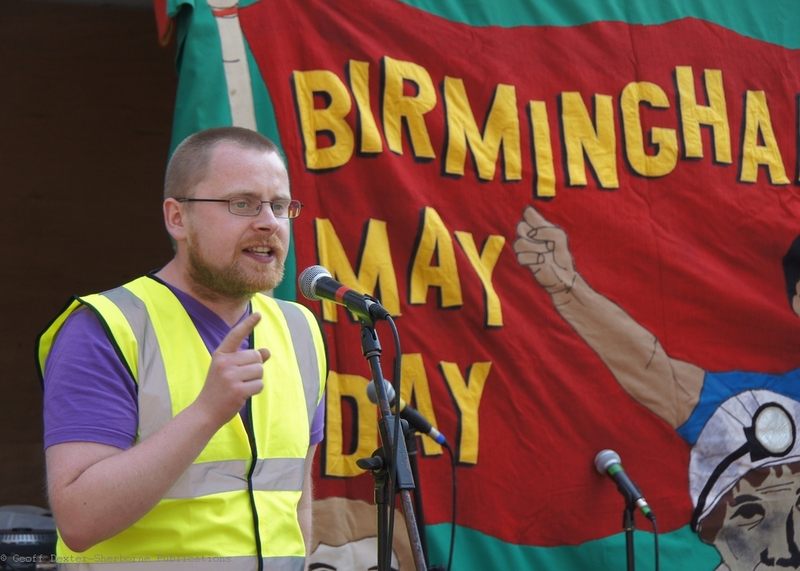 For the last 10 years, this has taken place inside, but this year working with Birmingham Against the Cuts, BTUC decided that it was time to get back onto the streets because of the savage cuts that are being implemented by the ConDem coalitions both nationally and locally. 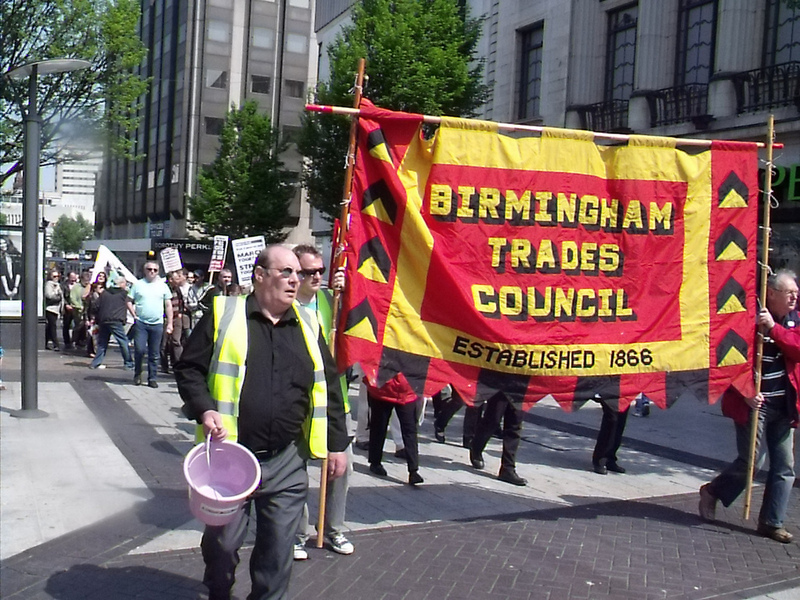 The march gathered at Birmingham Cathedral, with banners on display from the Trades Council, Birmingham Against the Cuts, CROSSBrum, Save the Blood Service, Socialist Workers Party, Socialist Resistance, Respect and others. 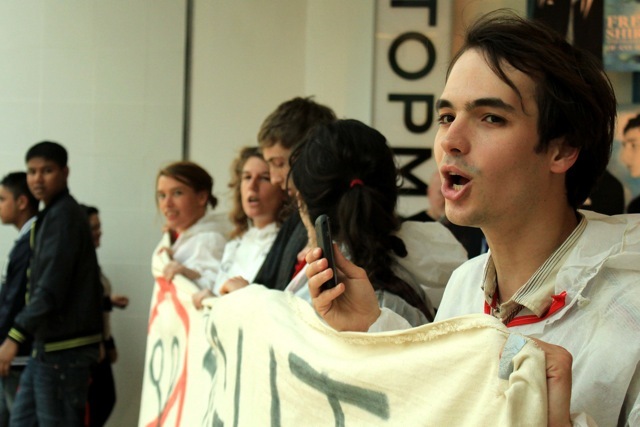 There was also a group of protestors dressed in white in solidarity with the 145 people arrested for peacefully protesting in Fortnum and Mason on March 26th. 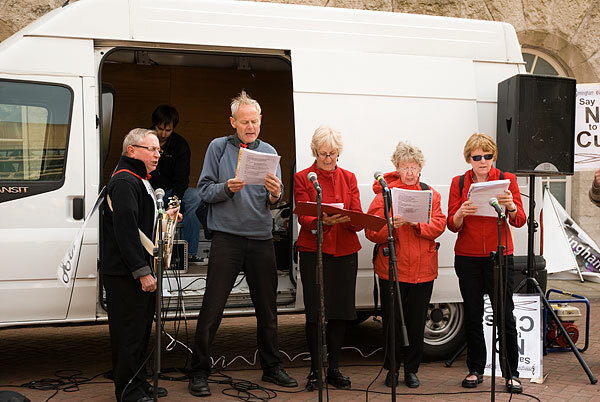 The march left the cathedral and went around the city centre to regather in Chamberlain Square for stalls, speakers and music – and this time we had a soundsystem so everyone could hear what was said! 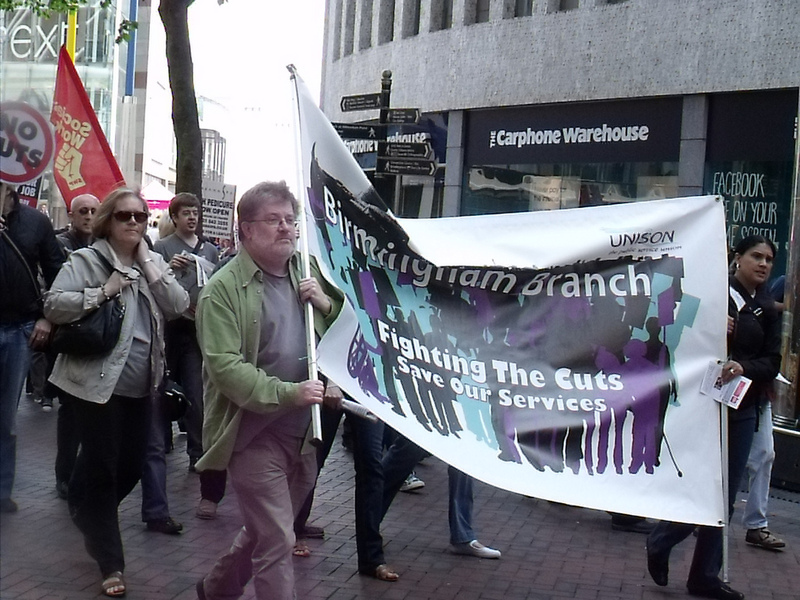 and giving a short background to some of the cuts and the trade union movement in Birmingham. before moving on to the upcoming struggle that UNISON will be waging against the council, who are seeking to make changes to terms and conditions that will see already low paid workers, such as home carers, losing as much as 1/3rd of their pay. 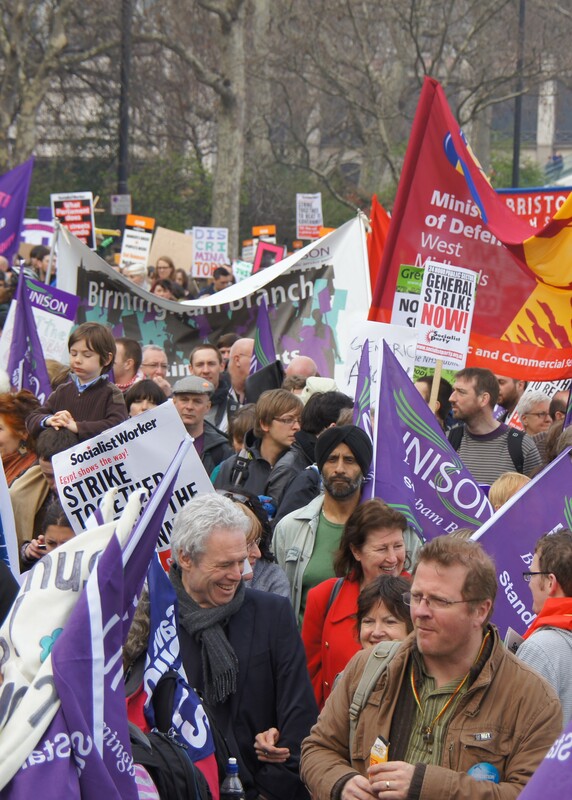 UNISON will be balloting through May for strike action, which if the ballot is succesful we are told will be planned to co-ordinate with other unions for a huge strike on the 30th June – we will keep you up to date on any developments there. 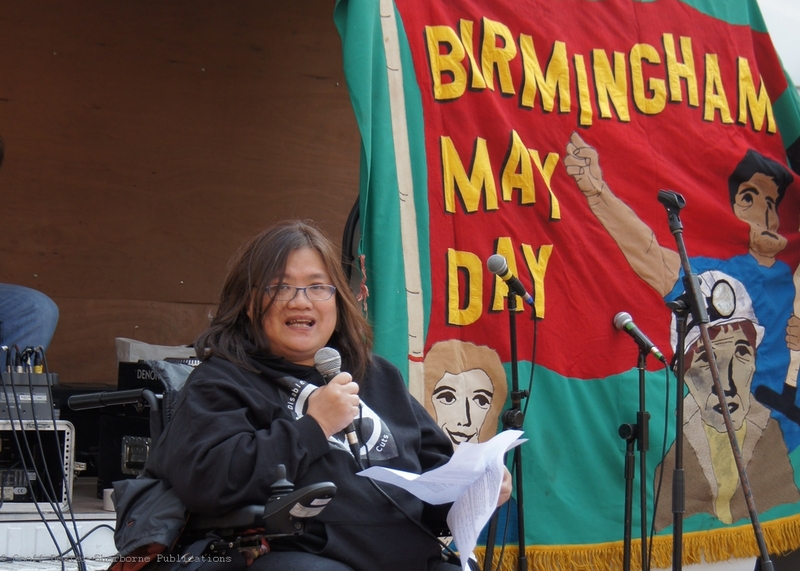 With the recent attacks on disabled claimants in the press, she went on to explain what DPAC and other groups are doing – there will be a national week of action against benefit cuts and against ATOS from the 9th may (with two events in Birmingham on the 12th and 13th). Of those tested by ATOS and found fit for work 70% who have representation and 40 % without any representation have the decision overturned on appeal, although it can take up to 12 months to reach a tribunal hearing because there are so many cases wrongly assessed. So when you hear the papers saying how many disabled people are found fit work work, remember that the vast majority of them are in fact found to be unable to work. 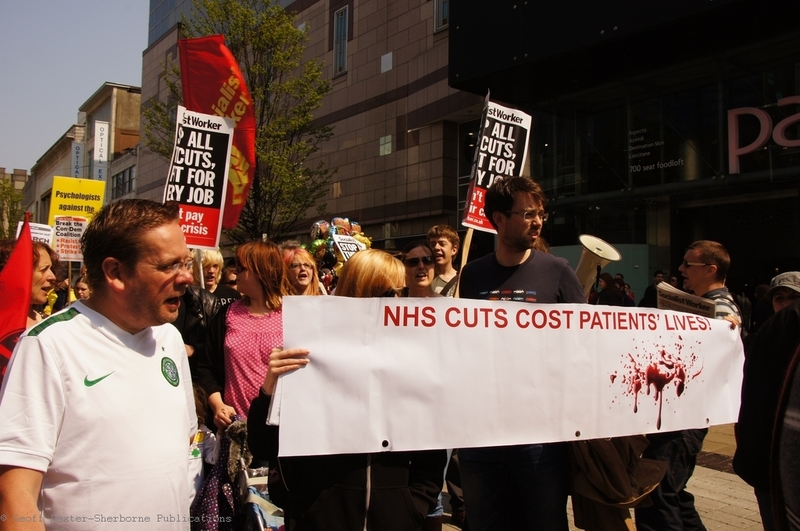 Vez Kirkpatrick, a health care assistant and UNISON member spoke about the NHS, saying that the budget is increasing very slightly, but not in line with the rising costs of drugs and the additional costs produced by a population that is living for longer. She talked about how the government released news on Friday, no doubt designed to coincide with the royal wedding, that the NHS will have to find an additional 50% in efficiency savings, and how this actually means the loss of 50,000 jobs. There will be 1,600 job cuts – 20% of staff – at the Heart of England trust, and 17% of jobs will be lost at University Hospital Birmingham – causing delays and cancellations in routine procedures, which can include things vital to quality of life such as hip replacements. 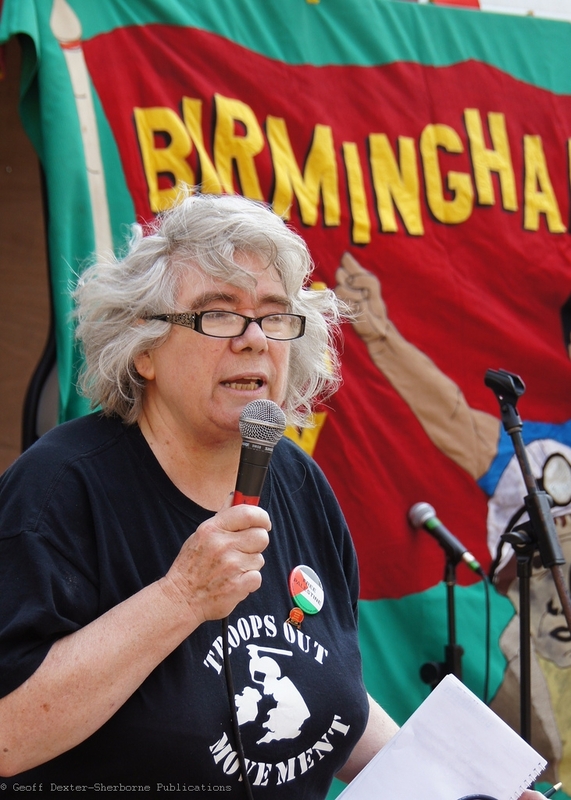 In summing up, Vez said that people need to work against the health bill currently passing through parliament and that Save the NHS West Midlands – a regional campaign group – has been set up and will launch shortly. Speakers from the Troops Out Movement, Stop the War Coalition and Unite Against Fascism spoke about issues which the trade union movement has been involved in, with Stuart Richardson from Stop the War pointing out the extreme costs of war – each cruise missile costs £700,000 – and how even though there’s no money for services for vulnerable people, there is always money for a war somewhere. The final two speakers were Charlie Friel, who spoke about the Connexions Strike coming up next week, and Doug Morgan from NUT who spoke about their forthcoming ballot for industrial action, which we hope will result in a strike on June 30th, co-ordinated nationally with ATL, PCS and Unite (health) and locally with Unison (council branch). All in all a good day. 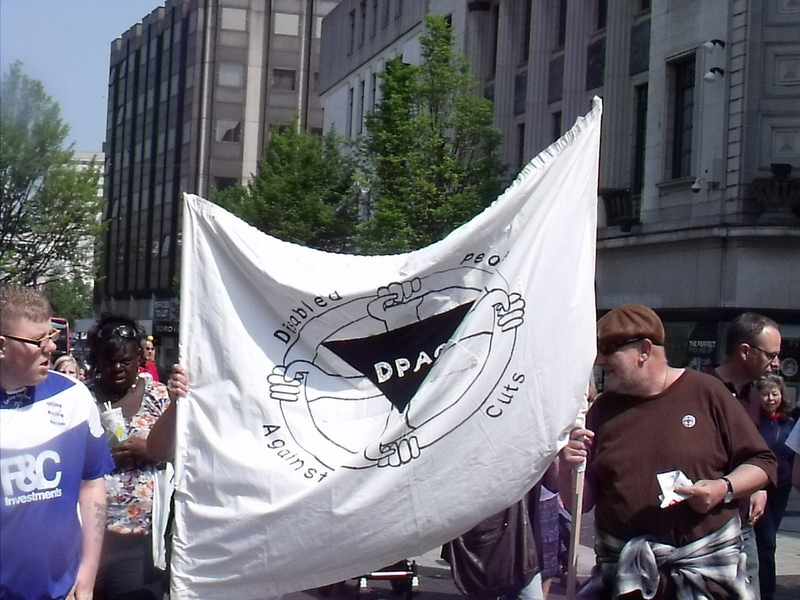 With thanks to Pete Jackson from Right to Work for getting these pictures up quickly, more photos to come I’m sure, keep an eye on our facebook page, and I’ll also add links to this post, and probably more photos – or I might just make a new post on Monday or Tuesday just with photos from the event. Workers at Equality and Human Rights Commission offices across the country will walk out for an hour from 11am to 12 noon on Wednesday 4 May and again on Wednesday 11 May. They are protesting over restructuring, job losses and a 55% budget cut that will set back 30 years of work promoting and improving equality. 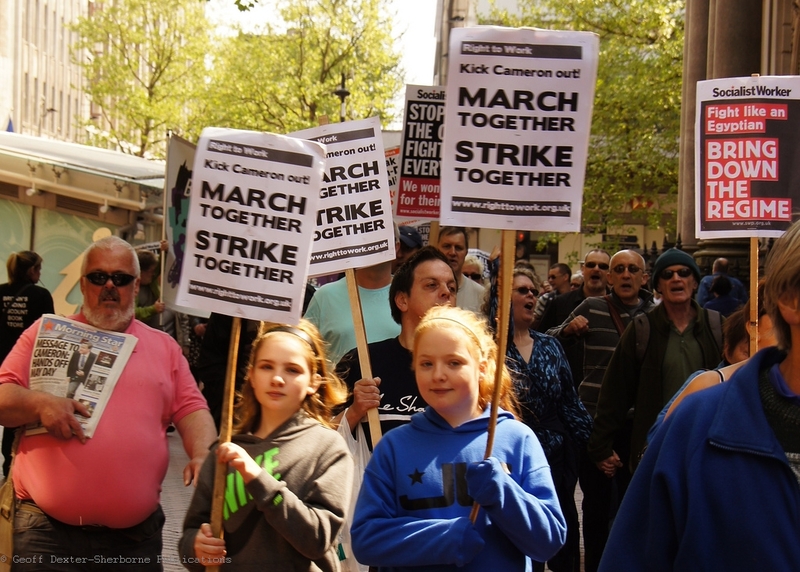 Connexions workers will also be striking on the 4th, so anyone free that day can get along to both pickets to show their solidarity, and also join us tomorrow for the Save our Services Mayday demonstration. 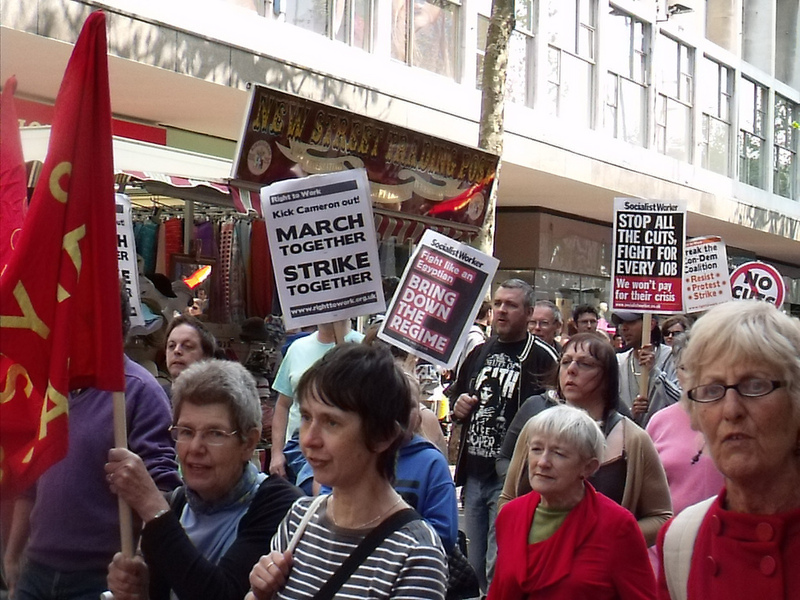 Yesterday we posted about possible strikes in the education sector over pensions. 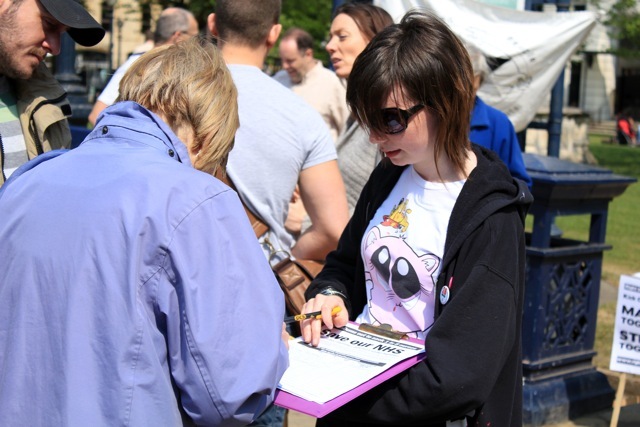 Teachers are not the only public sector workers to be affected by changes in pensions, and PCS are also balloting for strike action. Like the teachers, this ballot on pensions is being conducted against the backdrop of spending cuts and redundancies in the civil service. More than a quarter of a million civil and public servants could be balloted for strike over cuts to pensions, jobs and pay. 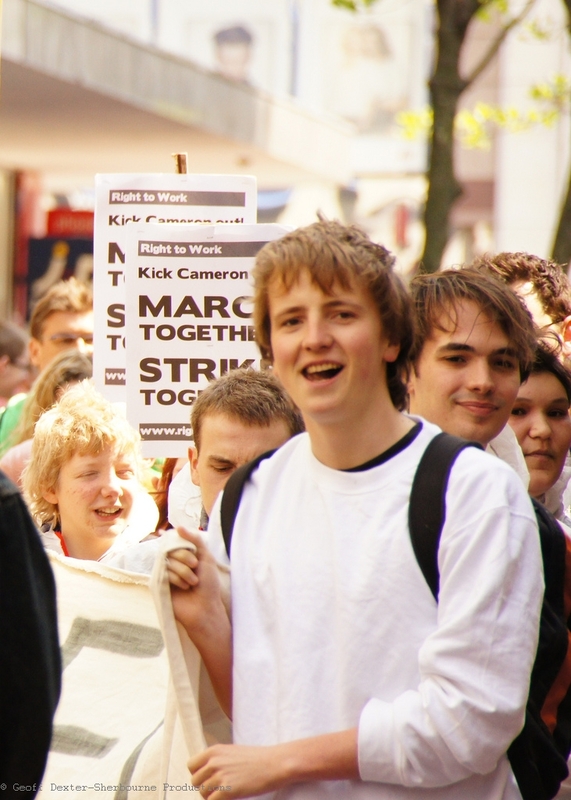 At least half a million people marched for the alternative on 26 March, and now we are saying we must be prepared to strike for the alternative. We are talking to other unions and will seek to ensure that any action we take has the widest possible support to put the maximum pressure on the government to end its ideological attacks on people who everyone acknowledges did nothing to cause the recession. 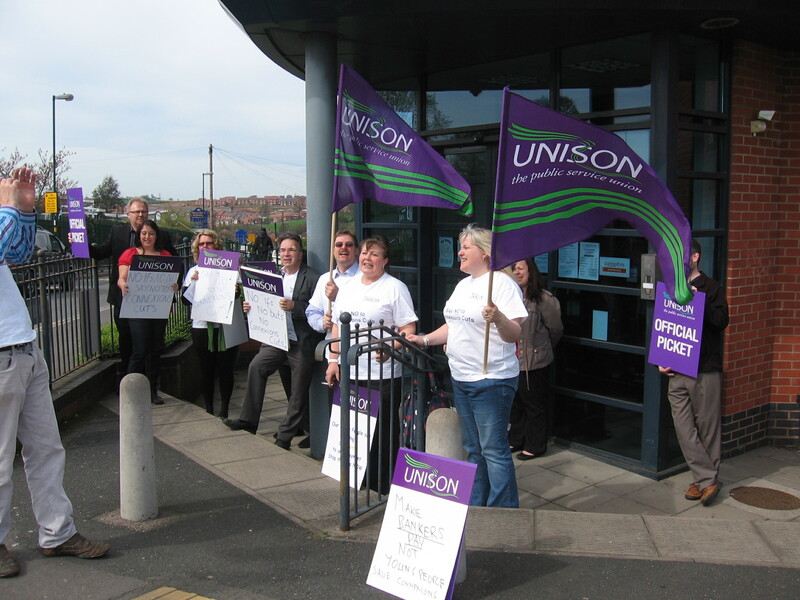 Locally, Unison will ballot for strike action by council workers during May and sources have indicated that they will try to co-ordinate their strikes with unions, though they are not sure if they will be able to. 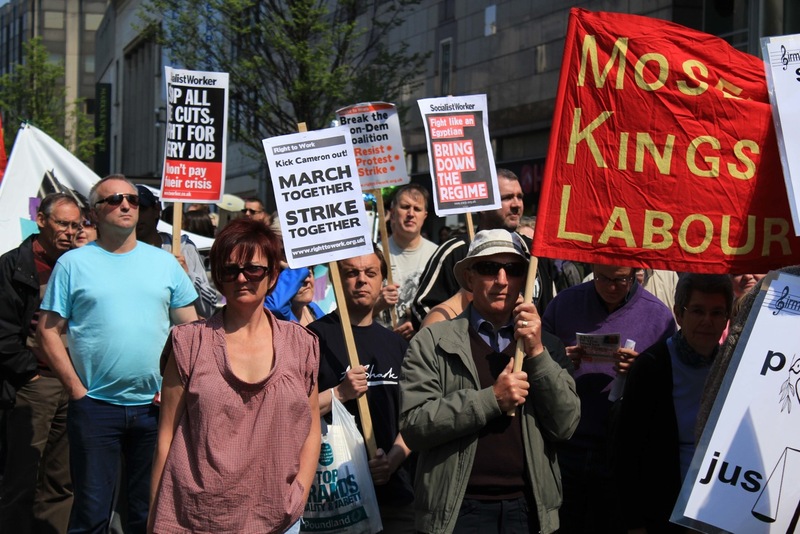 Nationally June 30th could see up to a million workers on strike – locally the city could be shut down with council workers, teachers and civil servants all on strike. 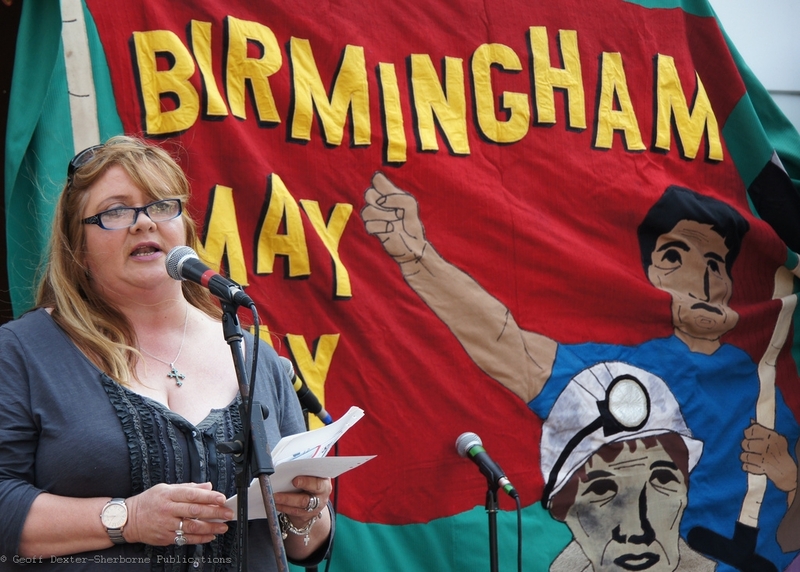 It is important that people come onto the streets on Saturday for Birmingham’s Mayday demonstration, to show solidarity with workers who will vote on strike action in May, so that they know they have the support of their community as they head towards taking industrial action to defend their jobs, pensions and working conditions. 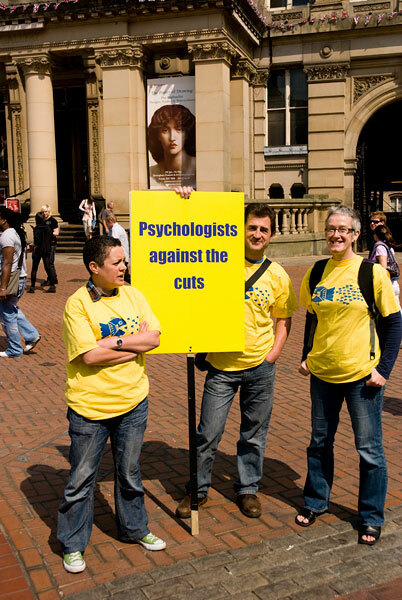 Over the past 2 weeks, the teaching unions – NUT, NASUWT and ATL – have held their national conferences, against a backdrop of “ringfenced” school budgets which actually means real-terms reductions in funding, cuts in the building maintenance grant of 80% and the removal and/or privatisation of school support services from Birmingham City Council. 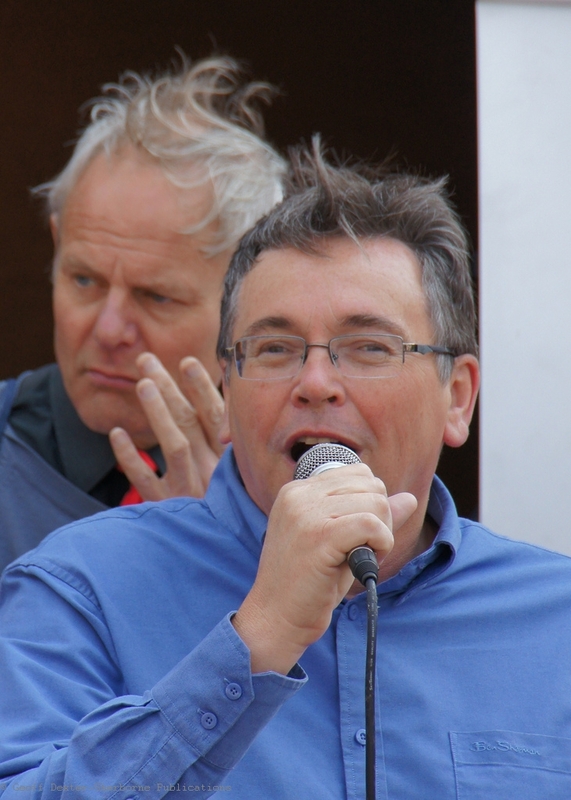 Edited to add: Head teachers association vote to ballot on strike action over pensions – getting awfully close to a general strike in education. We know of some schools making redundancies – 37 staff going at a school for children with behavioural issues, a significant number of whose students are children in care meaning that there are not parental networks getting outraged about these redundancies which will have a significant impact on very vulnerable children. We are also hearing news of other mainstream schools across Birmingham preparing to make redundancies amongst teaching and support staff, or not looking to replace staff who are retiring or moving to another school and the national media tells us that demand for training on handling redundancies has skyrocketed. Meanwhile more schools declare themselves to be academies, which means that they are no longer bound by national pay and conditions agreements, and staff face working longer hours for no more pay. In the long run creating a huge amount more work for unions as they will have to negotiate individually with every academy – potentially tens of thousands of employers – rather than a single negotiation. 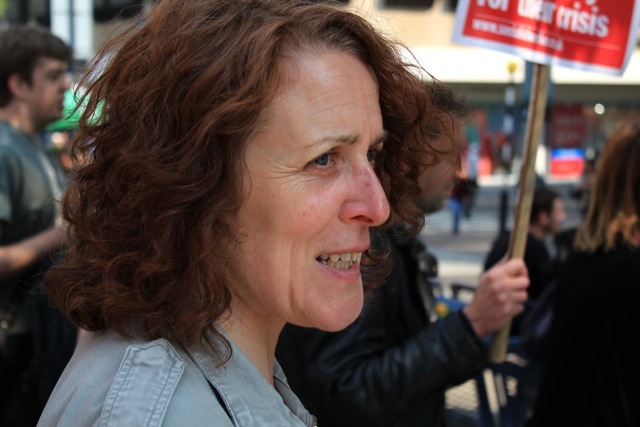 The attacks on teachers’ pensions, along with those of others in the public sector, have been well documented by the NUT. In summary they mean teachers will have to work longer, contribute more and get a smaller pension. The combination of a pay freeze and increased pension contributions alone will create a 12% fall in real incomes for those at work. This attempt to make workers pay for the economic crisis is justified by reference to our ‘gold-plated’ pensions and the so called apartheid between private and public pensions. The average teachers’ pension is less than £10,000 with only 5% getting over £20,000 – so much for ‘gold plated’. The real pension scandal is the fact that many workers in private companies have no pension scheme at all while a few get vastly inflated pensions. How is the Government going to force private companies to ensure that all workers get a pension scheme? Another argument trotted out is the unaffordability of teachers’ pensions. Yet in 2007 our pension scheme was reformed and this was said to be affordable and in fact the costs of the scheme have fallen, as Hutton has confirmed. The real reason for the attack on pensions is the Governments’ decision to pay off the debt caused by supporting the banks. They aim to make us pay for the crisis by driving down our pay and our pensions as well as attacks on our conditions of work. Rather than seek to collect in all the avoided taxes and make the wealthy pay a greater proportion of taxes the Government has decided to make those who have the least pay for their crisis. 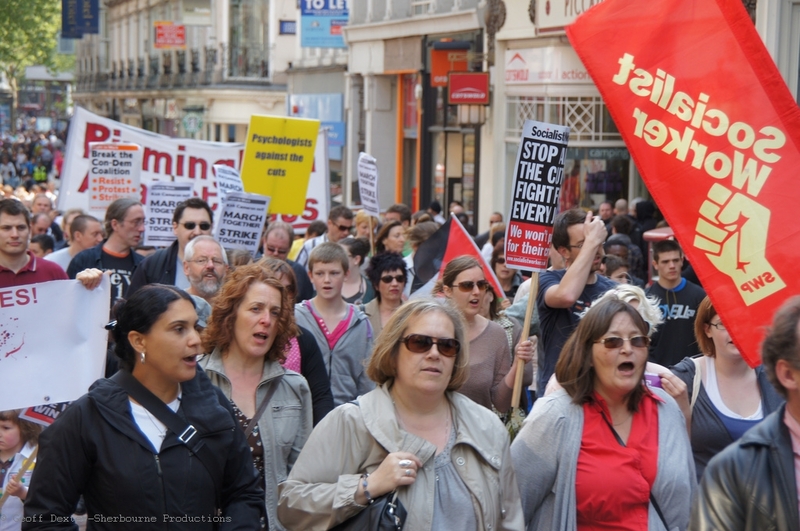 In the previous attack on our pensions, in 2005/6, the public sector unions began to organise collectively and managed to defeat some of the major changes the Labour Government wished to impose. This wasn’t a total victory, we had to concede a two tier pension scheme and greater individual contributions, but it did give us a way to fight using collective action. We need to build on that now at both a local and a national level. Local Associations and divisions should be taking the lead in organising local public sector alliances to defend our pensions and to build action at both a local and national level. At the conference, the NUT passed a motion in favour of co-ordinated strike action (this was almost unanimous with just 2 abstentions) over changes to the pension scheme. ATL, who have not been involved in industrial action since 1979 also passed a motion to ballot for strike. 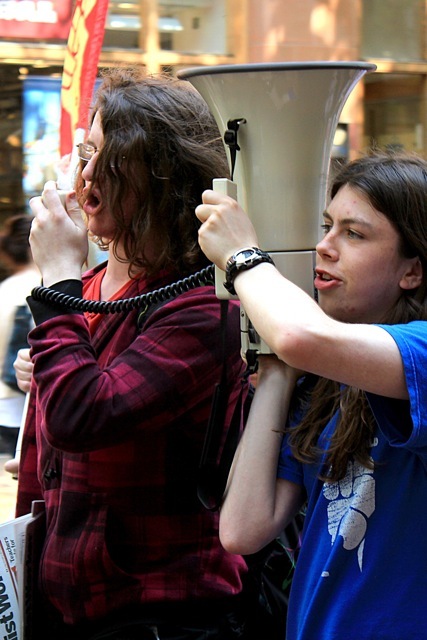 Both unions will ballot during May for a planned strike on 30th of June – the same day that PCS are balloting for strike action (more on that in a post tomorrow). 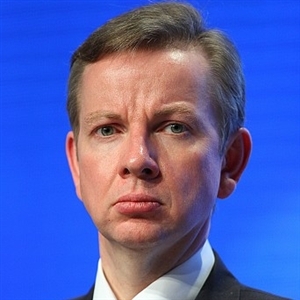 Meanwhile, NASUWT passed a motion at their conference stating that they would be willing to undertake industrial action to defend a system of national education in the country, and passed a motion of no conference in Michael Gove, the Tory education minister. With UCU having gone out on strike at universities last month, the education sector is looking to become a battleground for unions to defend their members and the children in school against cuts, and June 30th is set to be a huge day of strikes across the country with up to a million people out on strike that day. All the main teaching unions seem to be lined up together with a willingness to strike and could grind the education system to a halt if they chose to do so. 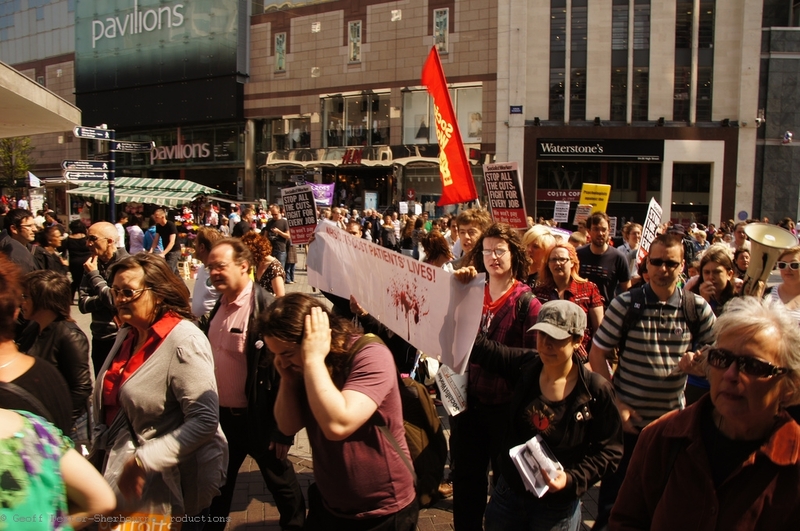 This Saturday (30th April) is Birmingham’s Save our Services Mayday demonstration. 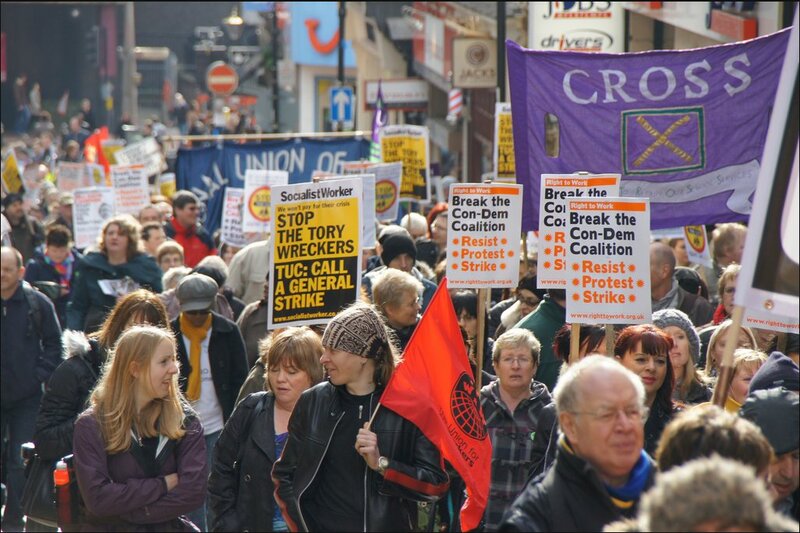 Mayday is the workers bank holiday and traditionally a time for the union movement to reflect on its achievements. This year though it should be a day for unions to look forward and show a willingness for action, and provides an opportunity for everyone to come out on the streets to show their support for strikers. This is particularly important for teachers who are often reluctant to strike because they do not want to damage any pupils education. They need to know that they have the support of parents and their community in striking to defend the education system. 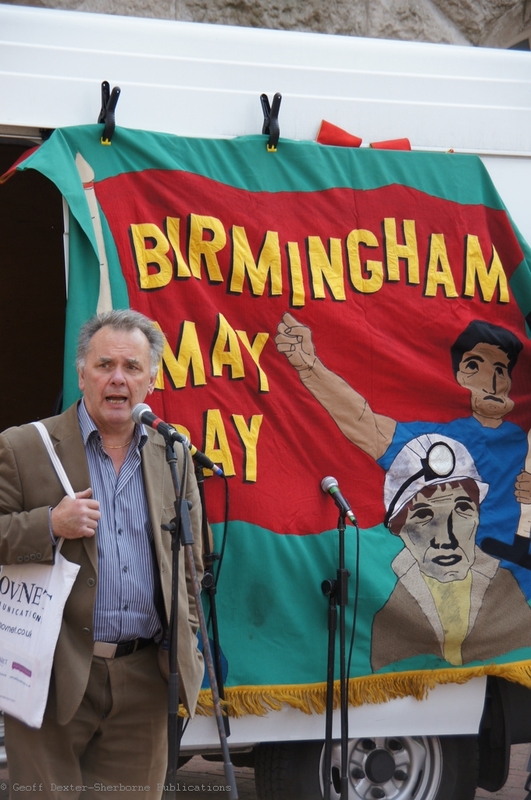 Birmingham Trades Union Council and Birmingham Against the Cuts have come together to organise this years Mayday demonstration. 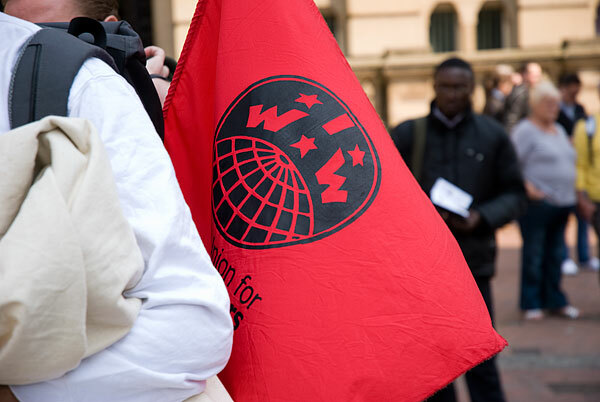 Mayday is the workers bank holiday, and a time for the trade union movement to reflect and celebrate it’s achievements. 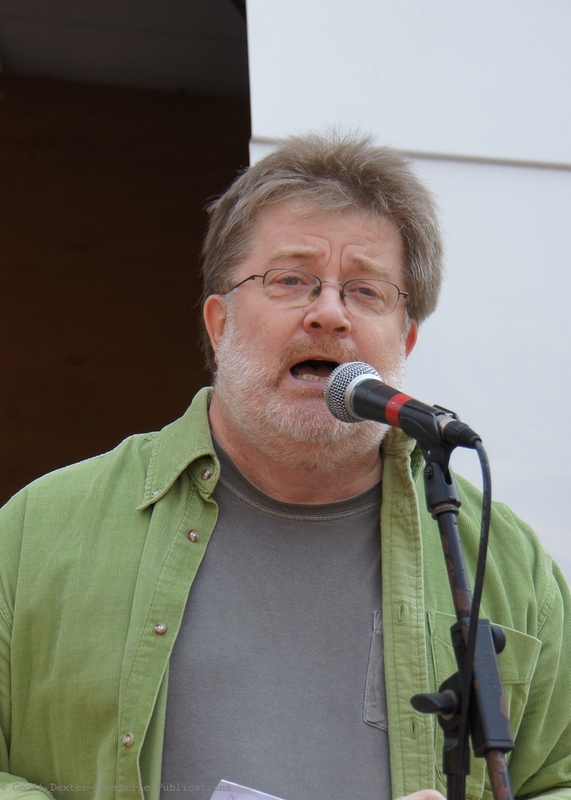 This year, the movement has a full on fight on its hands as it seeks to defend its members and the public from the huge cuts both local and central government are inflicting on the public sector. Hundreds of trade unionists and members of the public will be joined by opposition councillors and community groups in advance of the local elections to send a clear message to both the council and the Government, that they do not support the cuts. 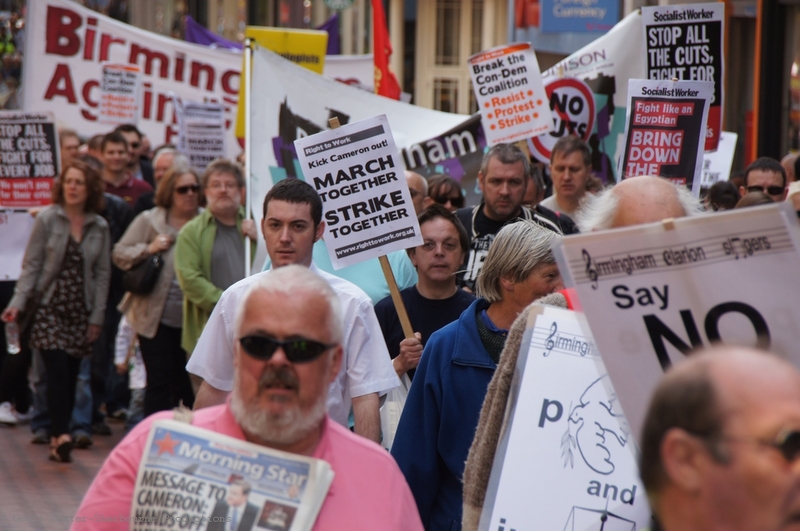 The march assembles at 12noon at Birmingham Cathedral, St. Philips Place with a rally in chamberlain square. Recently the Tory-Lib Dem run authority has signed off the biggest cutbacks in council history with a total of £320million to be cut over the next 3 years, 43 of 60 youth centre’s will close, children’s services will be cut by £69million severely affecting vulnerable children, many of whom are in care, home care is to be removed for 11,000 elderly and disabled residents unless legal challenges stop them and there are 2,500 job losses planned this year with 7,000 over the next 3 years. 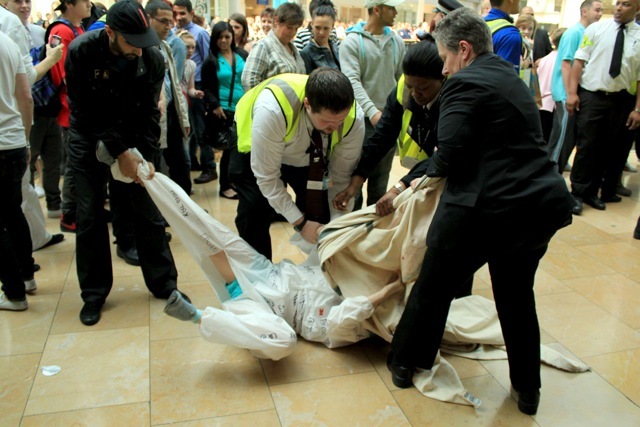 This is a scandal. 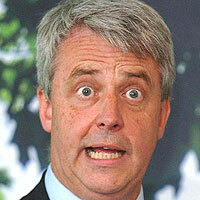 The public will be outraged when they are paying for the bankers’ crisis. Other cuts will see £5.2million taken from organisations which help vulnerable pupils, while free school travel is being largely withdrawn. Adults who use social care fare no better, with £35million of cutbacks. 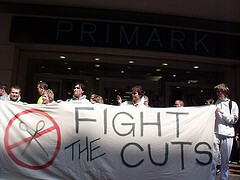 Low-paid workers in the city, the tenth most deprived part of England, will also be hit, some losing up to £3,150 a year. Home carers will lose more than £2,000 on average. How can this be right when the top 47 directors at the council keep their combined £4.6million? 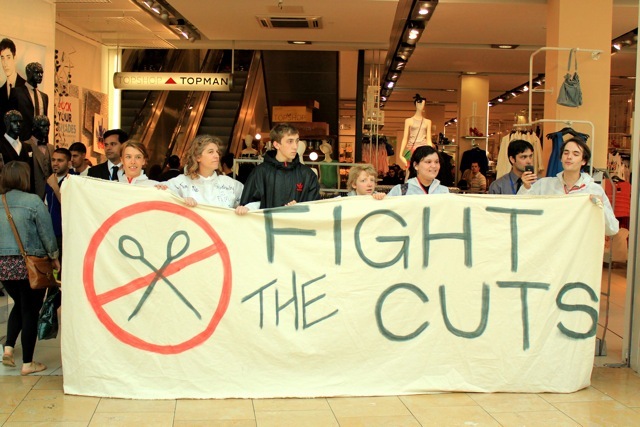 The cuts amount to £300 000 per day and a 20% cut in the council workforce with 1500 staff having already taken voluntary redundancy and another 2450 staff facing compulsory redundancy from a total workforce of 18 993 staff. 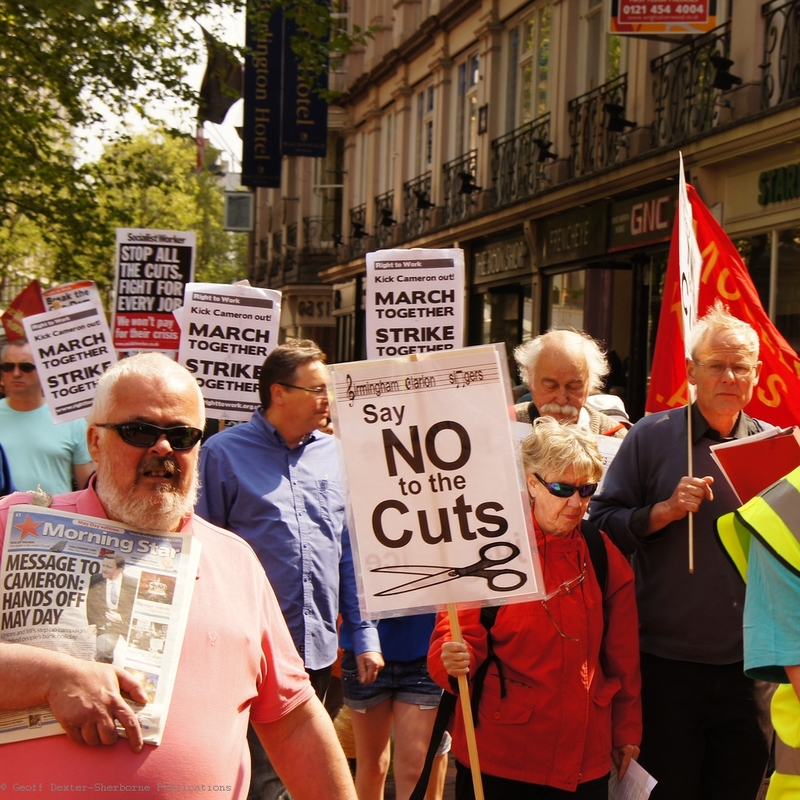 The demonstration follows on from the massive TUC march last month when half a million people marched on London, and is part of the lead up to wide spread industrial action involving up to 1million workers across the UK in late June. 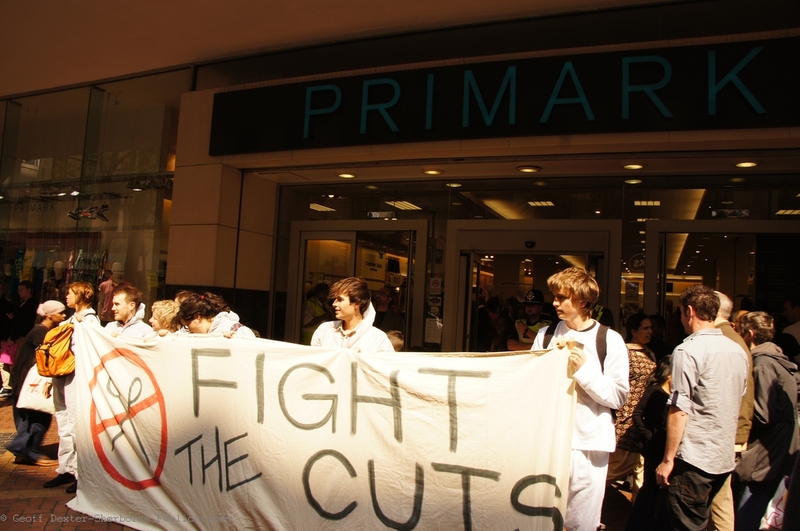 Trade unions including the PCS, NUT, ATL, UNITE (health Section), UCU and Birmingham Local government UNISON are expected to take coordinated industrial action against the cuts. 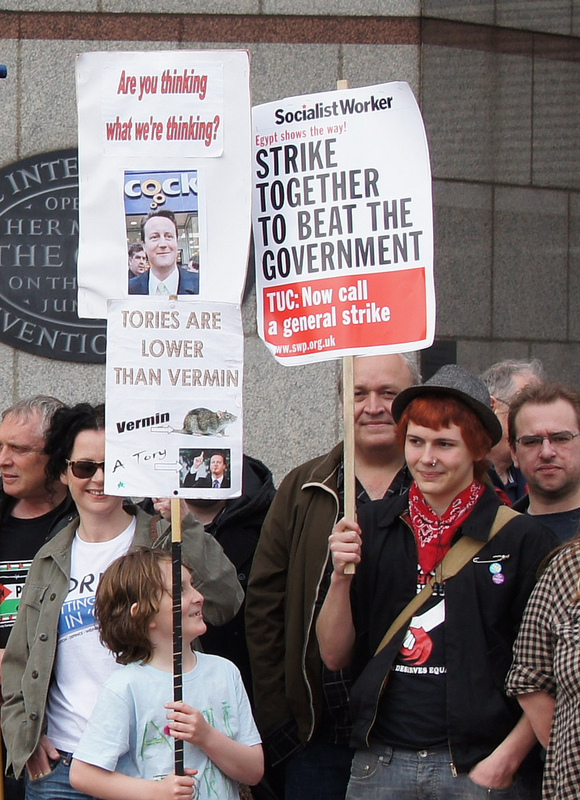 We will be reporting more on some of those strike actions over the next couple of days. 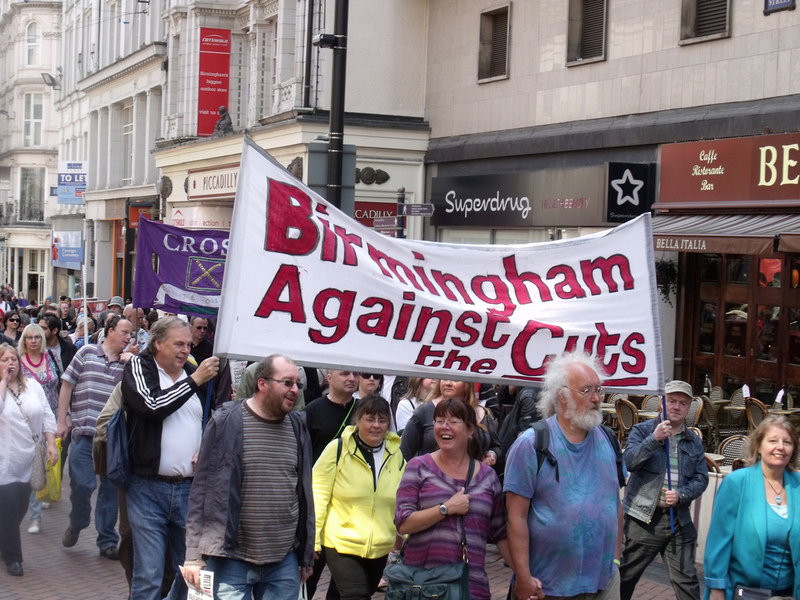 Whilst Birmingham City Council passed it’s budget back in March, slashing £212 million from its spending, the fight against those cuts did not die there and since then there have been some successful challenges in the courts. 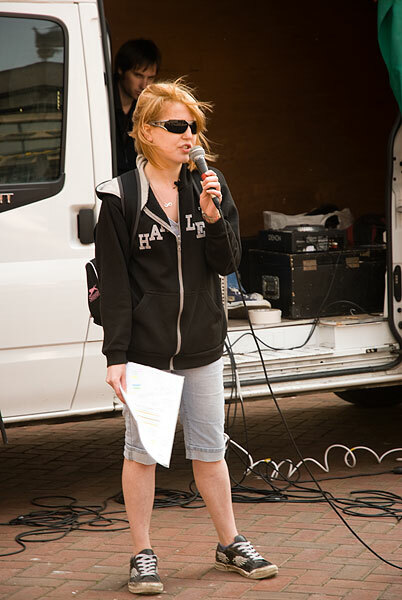 The first of those challenges was brought by users of 3 advice services – the Birmingham Tribunal Unit, the Chinese Community Centre Birmingham and St James Community Support & Advice Centre – and the high court ruled that the funding cuts were unlawful because the council had not carried out an equality assessment or proper consultation. 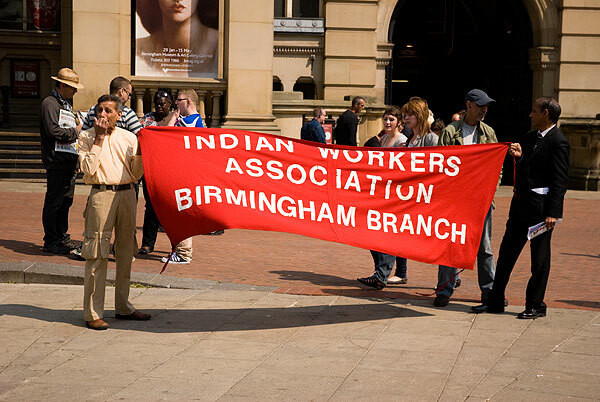 Funding was reinstated to these 3 groups immediately, and then to 10 other advisory services – including Birmingham CAB – when threats of legal action were made by those groups. This is only a temporary staving off of funding cuts – the council will now carry out equality assessments and consultation to make the cuts lawful, but it gives some breathing space to these services. The wider picture for similar challenges in the future is not looking great though, with funding cuts threatened to the EHRC and Legal Aid which will make it increasingly difficult for people to challenge through the courts. 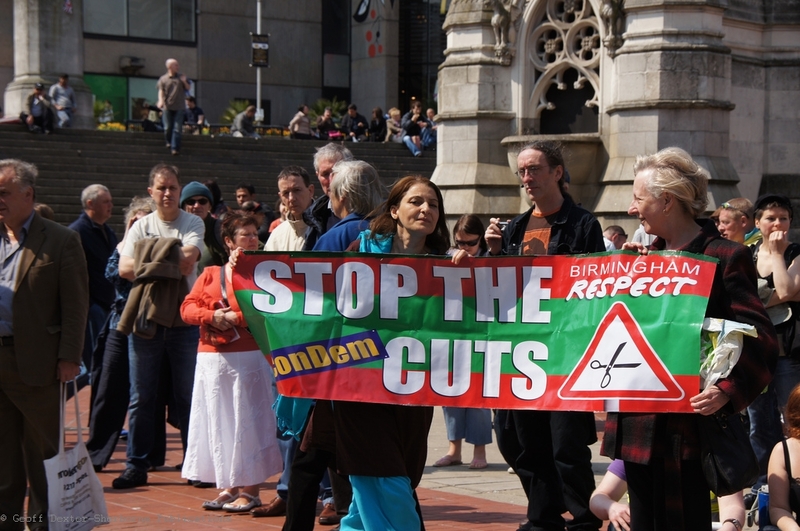 A different legal challenge to Birmingham City Council’s cuts also succeeded. This was brought by four claimants whose care was due to be withdrawn following the slashing of the adult care budget. We reported on this cut in the run up to the council cut demo’s back in February, that care provided to 11,000 adults would be reviewed and that at least 4,000 people who were judged to have “substantial” care needs would have their care removed. Mr Justice Walker found that the council had ignored provisions in the Disability Discrimination Act when deciding to withdraw this care. This ruling will have implications for all 4,000 adults who are likely to have their care withdrawn. Legal challenges to cuts will continue as people work to find ways to challenge decisions in the court that affect services vital to peoples quality of life. The fight against council cuts did not end with the budget decision in March, it continues in the courts and it continues on the streets. 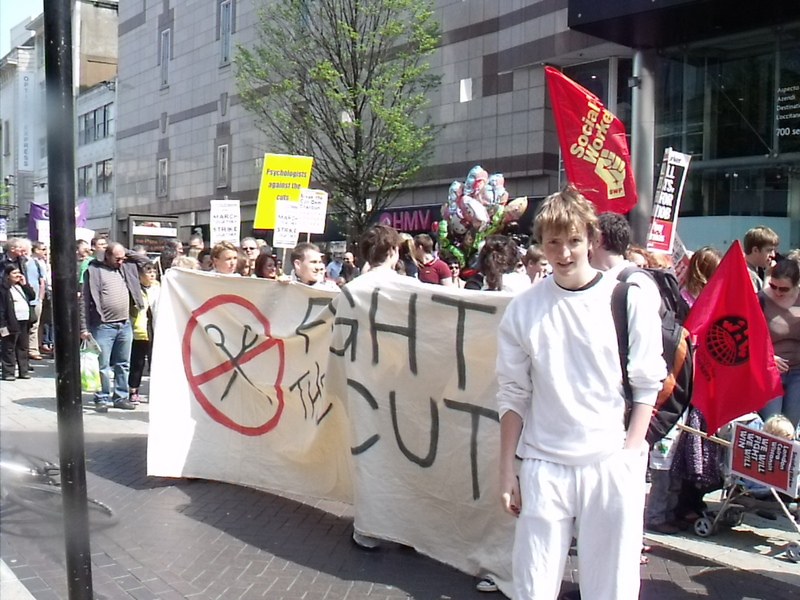 Come to our demonstration on Saturday 30th May and show support for everyone still facing the brunt of the cuts and to hear speakers talk about where these cuts are hitting.